The easy-to-handle OBD/CANID system links the two different bus technologies. In doing so, it bridges a gap in an automotive measurement environment growing increasingly complex. By means of this convenient tool the OBD sensor values of every current vehicle model can be tapped and integrated into CAN measurement chains. Conveniently, the desired OBD sensor values are selected via a PC configuration software and given the ID required in the CAN world. The dbc-file created by means of the configuration software can be imported into all the conventional data logging and analysis programmes and related to other measurands. As options, the system OBD/CANID can be equipped with an integrated GPS-receiver and a display. What is calculated is the geographic position, speed over ground, height, heading and other location-relevant information. 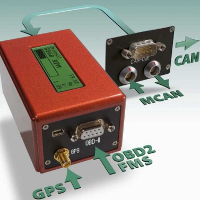 The information gained by means of the GPS-receiver can also be shown on the display, converted into CAN-messages and output at the CAN-jack with individually assignable CAN-IDs or as analogue or digital ouptut signals.